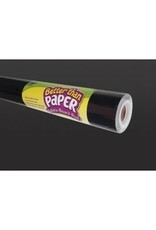 This revolutionary Black non-woven fabric makes creating beautiful bulletin board backdrops quick and easy! The lightweight material is simple to hang—no more struggling with paper that wrinkles and tears. Attach border trim, accents, posters, and student work with staples or tape and remove without ripping or leaving conspicuous holes. The durable write-on/wipe-off surface can be used again and again. Roll measures 4' x 12'.